Back in October, we talked about the top three factors that college admissions officers look for: your grades, course rigor, and your SAT or ACT scores. We’ve received a lot of questions about SAT and ACT scores this test season. To help answer some of these questions and provide guidance, we made a video just for you. Ben covers some important information about SAT and ACT scores. He also shares an infographic that you can download below. Enjoy the video! Hi, guys. Welcome back to another C2 Education video. Today we’re talking about some important questions about SAT and ACT scores. But first, don’t forget to go to c2education.com and register for one of our summer boot camps. From SAT and ACT test prep to accelerated study programs in any subject, we have an option to suit your needs to get ahead this summer. Go to c2education.com/summer for details. 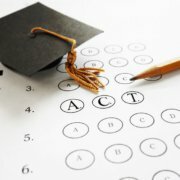 Why are SAT and ACT scores so important? It shouldn’t surprise you that SAT and ACT scores are important. In fact, colleges rank these test scores as a top three factor in admission decisions, right up there with grades and what classes you take. But why do admissions officers care so much about SAT and ACT scores? Put yourself in their shoes for a minute. You’ve got thousands and thousands of applications to review. These students go to all different kinds of high schools in different parts of the country with all different kinds of grading systems and different course levels. How do you compare a 97 in 10th Grade Honors English at one high school to a 90 in a gifted 10th grade Composition class from another school? It’s a pretty hard task. SAT and ACT scores, on the other hand, are the same no matter where you’re from, what school you go to, or when you take it. 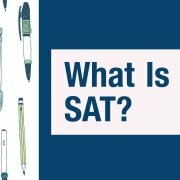 A 1500 on the SAT is a 1500 on the SAT. For some students, this is a good thing. If you’re a B student but you always rock standardized tests, your high test scores can help you out when you apply to college. But keep in mind, just because you have great grades, that doesn’t mean you can get a low score. 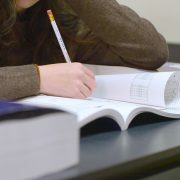 And for those students who get great grades but get queasy when thinking about bubble sheets, there’s still some good news: If you prepare in advance, you can get a great score. In fact, testing is its own beast, so how you do in school doesn’t necessarily show how you’ll do on the SAT or ACT. The skills that make you a great student don’t necessarily make you great test-taker, and vice versa. So, let’s think about that. 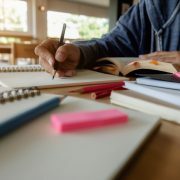 The same painstaking attention to detail that helps you ace your math assignments may not actually help you finish the math section on the SAT in time. Here are a couple things to keep in mind as you get ready for your SAT or ACT test date. Number one. Test prep is a marathon, not a sprint. You can’t prepare for the SAT or the ACT in just a couple days, or even weeks. The most successful test-takers spend months preparing. You want to do everything you can to make these scores help you get into your dream school. Number two. You should always start by taking a practice test. 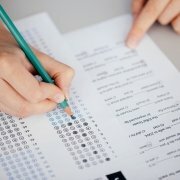 You won’t really know how you’ll do on the SAT or ACT until you go through one – and you definitely don’t want your trial run, or worse, your first time, to be on an official test day. Taking a practice test helps you know where you are, so you can figure out how to get the score you need. So what score do you need to get into college? To get started, we put together a great infographic that shows what scores you need to be considered by the top schools in the country. Just click on the link in the description below and check it out! If you found this video helpful, be sure to give it a thumbs up. Don’t forget to subscribe to our channel for more great videos on study tips, test prep and college admissions advice. And don’t forget to go to c2education.com and subscribe to our newsletter. That way we can keep you up to date on any new tools, resources, and events that will help you on your journey to your dream college.